banning fracking from Ireland. Here members of ‘Love Leitrim’ and supporters who campaigned to have fracking banned. Photo by Derek Speirs. 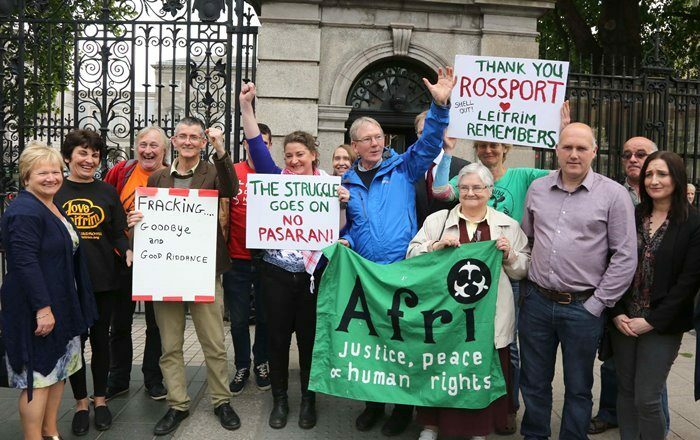 Afri has welcomed the completion of the Bill to ban fracking which today passed all stages in the Dáil and will now go to the Seanad. “This is a victory for people power and for community resistance”, according to Joe Murray. Afri would especially like to congratulate Love Leitrim who led this persistent, determined and successful campaign. We also pay tribute to the community in Rossport for the part they played in this success as it was John Monaghan who first alerted the community in Manorhamilton, Co. Leitrim, to the dangers of fracking and who urged the community to organise and resist.